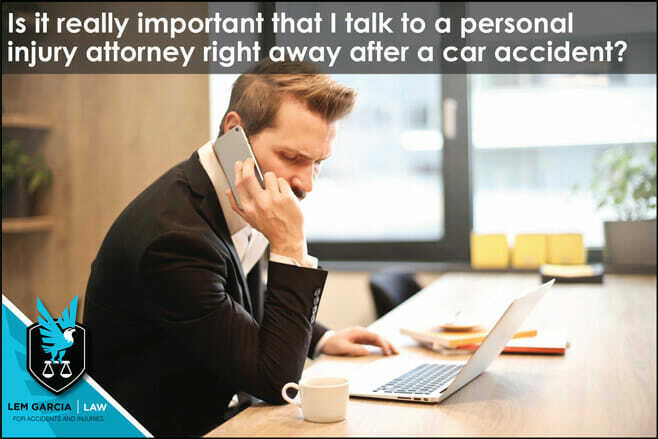 Is it really important that I talk to a personal injury attorney right away after a car accident? Yes, you should contact an experienced personal injury attorney immediately after a car accident. After you have been able to file a police report, take pictures of the scene, gather information, and get medical attention, it is very important that you talk to an attorney right away. Do not call the insurance company first. Insurance companies would like you to believe that it is imperative that you call them immediately after a car accident or you will not be able to claim any benefits under your policy. This is not true. It is important that your accident gets reported to the insurance companies, but you are under no obligation whatsoever to report the crash yourself. It is best to have an experienced personal injury lawyer handle the insurance companies for you. The reason why it is important to talk to an attorney first, is because only an attorney that represents you is truly on your side. Neither your insurance company nor the insurance company of the other party is on your side. Both insurance companies involved in the crash are only looking out for their own interests. The insurance adjuster that you are speaking to on the phone is trained to pay you as little as possible for your damages – both property damage and physical injury. Only an attorney will be there to make sure that the insurance company pays you what you are owed. It is important that you talk to an attorney right away because there are important steps that you need to take – or not take – to preserve the value of your claim. For example, the insurance company will want to take your recorded statement when the speak to you. Unfortunately, they want to take your recorded statement to damage your case. The insurance company will also attempt to settle your case for less than what is worth. If you trust the person on the phone because they sound nice, you might settle your case for less than what it is worth. Case consultations with personal injury lawyers are usually free and without any obligation. You should take advantage of this opportunity and find an attorney that you like and trust. West Covina car accident lawyer, Lem Garcia, offers free case strategy session to people who have been injured in a car crash. Call or text us anytime to schedule your free case strategy session today.